James Henry, a kind-hearted professor of English literature, is forced to move back home to Quincy's Gap, a tiny town in Virginia's Shenandoah Valley, to care for his aging father. Shortly after moving into a house that hasn't changed since his childhood, the overweight, divorced, book-loving cheese puff addict accepts a position as head librarian and joins a supper club for dieters who call themselves the 'Flab Five.' 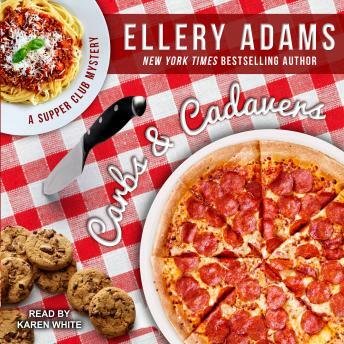 Avoiding carbs is almost impossible in this deep-fried, all-you-can-eat Southern town, so the mysterious death of a young and healthy athlete provides the perfect distraction. While trying to cut carbs and avoid temptations, James and his fellow supper club members work together to shed pounds and track down a killer. The story is okay with believable characters... until the end. Narrator was fine until she assumed voices. I do not think the parents of a twenty year old would sound 80. And that’s how it was with multiple characters. It became so annoying I almost gave up on the story itself. Anyone over 40 was depicted as ancient, anyone young was depicted in child-like whispery voice. Perhaps this narrator should let the listener imagine tenor and pitch in her next go-round.